Hardwood floors are enjoying a renaissance, of sorts. 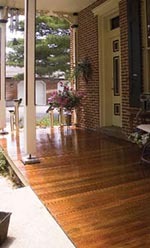 More homeowners today are adding hardwood flooring, remodeling existing homes, and trading up to hardwood in new homes. Here are some of the many reasons why you should consider hardwood flooring. 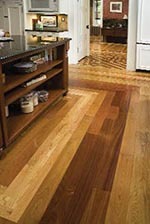 Hardwood floors are more affordable than ever and increase the value of your property when it's time to sell. Hardwood floors are environmentally friendly since many hardwood floors are made of recycled and reconditioned materials such as barns, warehouses and old ships. When it comes to cleaning, hardwood floors are a breeze, needing only vacuuming and occasional damp sponge mopping. Hardwood floors provide health benefits for people with allergies and asthma by reducing dust mites and increasing cleanliness. When maintained properly, your hardwood floors will outlive you. There are more varieties of hardwood floors available today than ever before, from traditional to exotic. The beauty of real hardwood floors cannot be imitated. Your floors are the first thing people see when they enter your house. Hardwood floors make a statement.